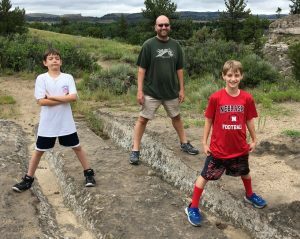 My brother (center), his son (right), and my oldest son (left) straddle Oregon Trail ruts in Guernsey, WY. 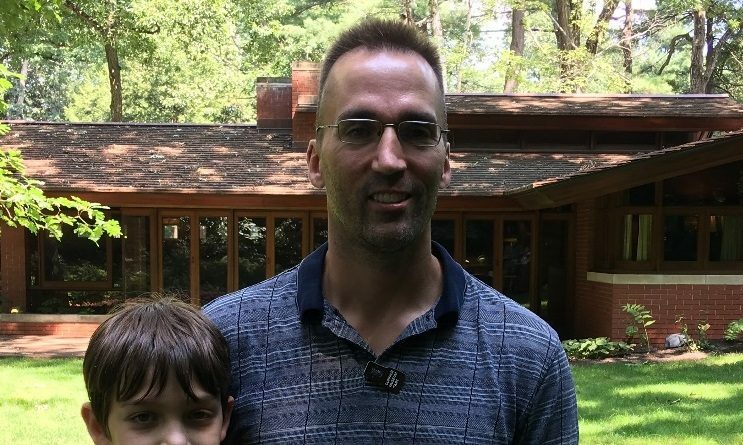 The final summer update from our returning student bloggers comes from Gary, a current PhD candidate, who managed to fit in several conferences in DC, as well as a cross-country family road trip. Last time I wrote in this space, I included a preview of how I intended to spend my Fletcher summer. This post will briefly recap what I actually did. BLUF (bottom line up front): it was a lot of fun! And it went by fast. The fall semester is rapidly approaching its mid-point as I write this. The summer proceeded in two phases, just as I had forecasted. I spent the first half in and around the Boston area with two brief stints in Washington, D.C. In May, I attended two conferences, one on China’s military aviation development, and the other a Korea security conference. In June, I returned for the Center for a New American Security’s annual conference, followed by a weapons of mass destruction conference at National Defense University, and a meeting at the Center for Strategic and International Studies. For the June trip, I drove to D.C. and back as a bit of a warm-up for the more extended block of driving to come. The second half of the summer was the road trip with my kids. 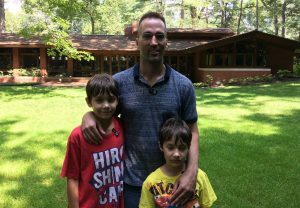 Though I didn’t realize it at the time, the second half of the summer would be bookended by visits to Frank Lloyd Wright-designed houses. We set out from Boston for parts west, and our first stop was Buffalo, NY. I’d made arrangements for us to tour the Martin House there. My boys and I located it without issue, but just before we started on the guided tour we’d arranged previously, my youngest son got sick forcing us to cancel. We ended up seeing only the visitor’s center and the outside of the house—bummer. Thankfully, my son quickly recovered, and we were able to continue with our travels the next day as scheduled. We continued westward and eventually reached Iowa, where we met up with my older brother and his son, who would accompany us on our travels from that point onward. From there, my brother and I shared the driving responsibilities, which was very welcome! We crossed South Dakota, saw Mount Rushmore and the Crazy Horse Monument, then pushed on into Wyoming and visited the Devil’s Tower National Monument, which is probably still most famous for its appearance in the late 1970s Steven Spielberg picture Close Encounters of the Third Kind. After that, it was on to the highlight of the road trip, Yellowstone National Park. We spent a fantastic few days there seeing all manner of natural splendor and wildlife, hiking, and just enjoying the outdoors. It’s not something any of us will soon forget. After a brief foray into eastern Idaho and the northern Utah, which marked our farthest line of westward advance, we turned the car back eastward and crossed southern Wyoming into Nebraska. Before heading to the more populated eastern portion of the state where our extended family lives, we stopped off to see the Scotts Bluff National Monument, Courthouse Rock, Carhenge, and Toadstool Geologic Park, which, counter to what one might have expected, may have been the highlight of the trip for the kids. It provided more of a hands-on experience than the previous park and monument visits. Here, they could climb up on rocks and be right up near the unusual geological formations. I did manage to work a pair of events related to my studies at Fletcher during this portion of the trip. I spent a week in Colorado participating in a fantastic seminar in history and statecraft put on by the Clements Center for National Security at the University of Texas at Austin. I hadn’t previously been to Beaver Creek, but it was a beautiful setting for wide-ranging discussions of grand strategy, intelligence, history, leadership, diplomacy, and more. Fletcher alumnus Philip Zelikow (F95) was among the mentors that spent the week with us. All told, there were four people with ties to Fletcher participating in the seminar, alumni Zelikow and Alexis Herrera Moreno (F10), and current Ph.D. candidates Neha Ansari and myself. Not a bad showing for Team Fletcher! The second event was the U.S. Strategic Command Deterrence Symposium. This one was easy to go to since I was already staying in Omaha. To keep things fresh, on the drive back from Nebraska to Massachusetts, I chose a more southerly route, passing through Missouri, Illinois, Indiana, Kentucky, and West Virginia before turning and driving north through Virginia, Maryland, Pennsylvania, New York, and Connecticut. Being able to travel across the U.S. this summer was an excellent opportunity to catch up with several old friends scattered across “the fruited plain” whom I had not seen in a while (20 years, in one case!) and also to spend time with family. In all, this summer my sons and I traversed nearly 20 states and advanced more than 2/3 of the way across the continental United States (and back! ), putting something close to 10,000 miles on the car in the process. It was a memorable way to spend the summer, one not often afforded to military families. When we arrived back in Boston in mid-August, a couple of weeks remained of the summer before Labor Day and the start of classes. During the summer, Jessica Daniels, the long-time Associate Director of Admissions at Fletcher, primary interlocutor with the cohort of Ph.D. students and Admissions blog master, announced she would be leaving at the end of August. Thankfully, before she departed, I was able to stop by and visit with her one last time. Jessica gave me one last valuable nugget of information: there was a Frank Lloyd Wright-designed house only one hour from Tufts, in Manchester, New Hampshire! However, she added that it could only be viewed via reservation on a guided tour. I went home that day and looked it up. Sure enough, the Zimmerman House was not far away, and through the Currier Museum of Art, we soon had tickets. I took my sons with me to see it one day not long before classes started. They may yet end up as architecture aficionados like their dad!